Add this fabulous Hermes Ronde rose gold bracelet to your stack. 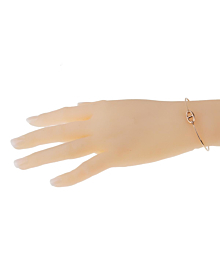 By Hermes, this round skinny bangle, elegant and simple, is made in solid 18kt rose gold. Featuring their signature Chaine d'Ancre motif, evocative of an equestrian link, the bangle incorporates a closed, hooked clasp in the front.